Frank M. Archer, whose name can be found on many Moxie collectibles was the Lee Iococca of the early 20's and 30's. He promoted the soft drink in every form of advertising medium of the time. These items included: kids toys, piano rolls, recordings, sheet music, Moxie Candy, loving cups, china and silverware given away at civic events, lap boards for picnics, fans featuring silent movie stars of the era, and massive national advertising in printed media. Many of these ads featured stars of film, stage, and sports celebrities, not unlike what we see on the tube these days. Ed Wynn and the great George M. Cohan were amongst the many celebrities who made Moxie ads. In the early 60's, even Ted Williams was a spokesperson for Moxie. 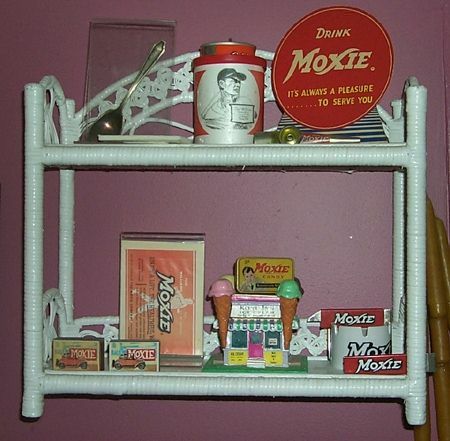 These many items represent just a small part of the former Moxie giveaways which are now "collectibles" showing the Moxie logo. In the late 1920's, "Moxieland" was built in Boston. Moxieland replaced the smaller Lowell manufacturing facility (as well as an earlier Boston plant) and was sucessfully promoted as a tourist attraction. Almost overnight, "Moxieland" became as famous as any Boston landmark. "Moxieland" even boasted a directional advertising sign on the roof for aircraft heading towards the East Boston Airport (now Logan International Airport) shown below. Mr. Archer never missed an opportunity to promote his product.